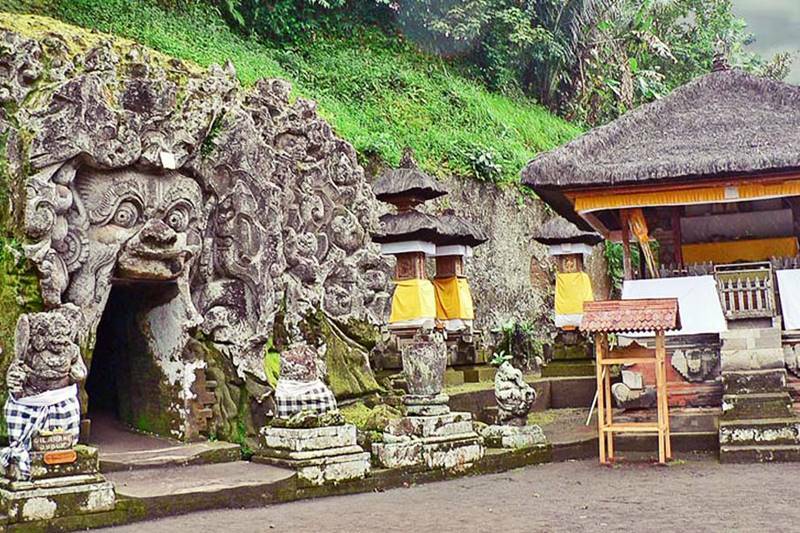 Goa Gajah tourism object, is truly a historical heritage in the form of a temple in Bali. The location is in the village of Bedulu, Blahbatuh District, Gianyar Regency. Adjacent to Ubud so that it is better known as a tourist attraction in Goa Gajah Ubud. The trip Bali Airport takes around 1,5 hour drive. This object had been suggested as a world cultural heritage, but still awaiting a decision from the UNESCO. Our Bali car rental with experience English speaking driver will accompanied your day for the best sightseeing in Bali. Goa Gajah temple itself is estimated to be built in the XI century AD during the reign of the Warmadewa dynasty, which functioned as a holy place for Buddhists and Hindus. The nuances that are presented are not as the name Goa Gajah, there are no presence characteristics, apparitions and ornaments that indicate the presence of elephants. Different if you are in Goa Lawah Temple in Klungkung the name characterizes the place inhabited by thousands of bats. 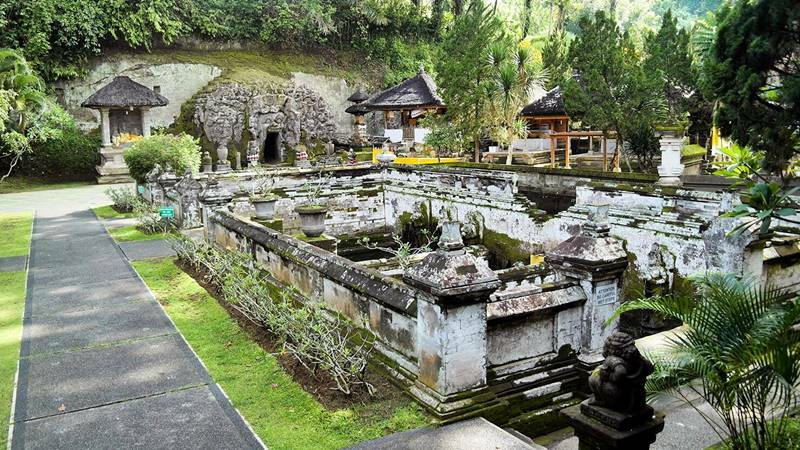 If choosing a tour in Bali, and wanting to visit a number of attractions in the Ubud area, Goa Gajah is only a 10-minute drive from the center of Ubud. For the tourists who join the Kintamani Tour package automatically visit Goa Gajah as one of the tourist destinations in Bali. Its location is very strategic on the main road of Bedulu, so it can take time to visit here, without needing a lot of time, before going up to the main destination of Kintamani. Once Arrive in the parking lot, we should walk down and pay an entrance ticket, you go down a few dozen stairs to get to the location. From the steps you can see the natural beauty of the surroundings, surrounded by trees, there is a large tree on the river bank that is said to be hundreds of years old, the location of Goa Gajah is on the edge of a river near a cliff, and below it is a meeting of two tributaries with various grove the tree makes it feel cool. 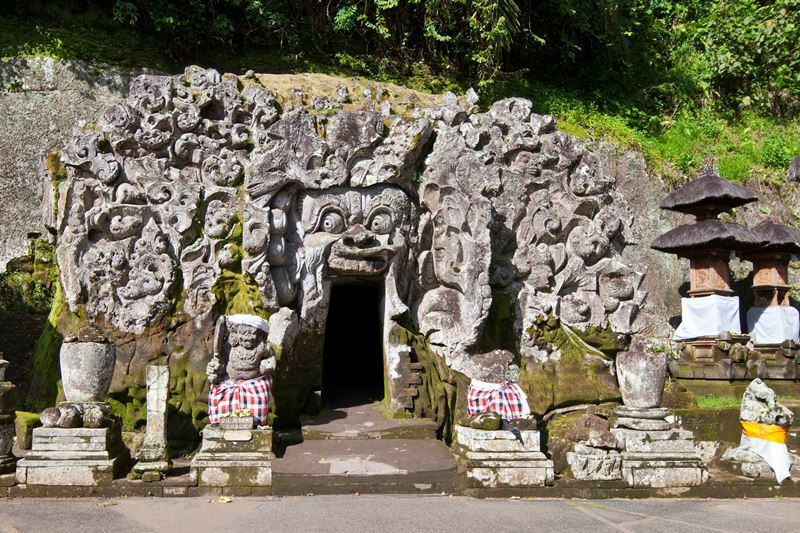 Goa Gajah Ubud tourism object, has a cave with Boma engraving on its mouth, with a T-shaped hallway, after you enter a few meters, you can enter the aisle branch to the left or right, the hall is dead-end and not too wide. The height of the aisle is about 2 meters wide by 2 meters too. There is a niche on the cave wall which is use for meditation in the past. At the end of the left aisle there is a statue of Ganesha and right there are 3 pieces of phallus or Lingga. According to some sources Goa Gajah comes from the word “Lwa” means River and some say “Lwa Gajah” which is interpreted by the monastery as Buddhist worship, especially by monks, with the meeting of tributaries in the tourist area of Goa Gajah Ubud, it can be assumed that the area which is located on the banks of this river as a place of retreat by the monks. In the court of Goa Gajah there is a petirtan area, you have to go down some stairs to get to the petirtan area. Here stands 7 widyadara statues – widyadari holding a jar with holy water flowing into a pond. Goa Gajah’s attractions are favored by tourists because they offer many uniqueness. Then what are the uniqueness found in Goa Gajah Bali? 1. The cave entrance is only enough for 1 person. 2. Outside the entrance there are carvings and 2 guard statues. 3. The inside of the cave is in the shape of a T, about 2 meters high and 2 meters wide. 4. The left and right parts of the aisle also have niches that may have been meditating in ancient times. But now tourists can sit or lie there. As one of the tourist attractions in Bali that presents the beauty of nature and is a cultural heritage, Goa Gajah should be visited, and other interesting object which located quite close is Tirta Empul, Gunung Kawi and Kintamani. Or if you love to combine the historical heritage with adventure, we may suggested after Goa Gajah visit, you may do some adventure activities like Quad ride, Rafting at Ubud, Tubing at Ubud or at Tampak siring, Skutis at Negari. If you want combine this tour with wild life, we may visit Bali Bird Park, Bali Zoo or Bali Safari and Marine Park for the biggest park in Bali. If you plan visit Goa Gajah and doing some sightseeing afterward, we provide various Bali rental cars, starting with regular cars such as Toyota Avanza, APV or Xenia, to luxury vehicles in the limousine class. If you travel with a large group, we provide tourism buses. And to be sure, you will be accompanied by friendly driver of Bali.